Tired of re listening to old hits during your ride? If you were travelling from one end of Singaporeto the other, this album will provide you with about half an hour of decent road trip music. 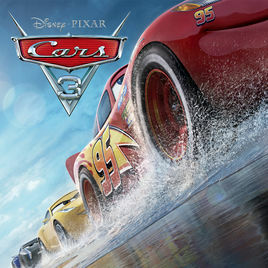 If you were driving, the fact that this soundtrack stems from the third instalment of Disney/ Pixar’s franchise (Cars, Cars 2) makes the experience sweeter! Kicking off the 29 minute CD is Dan Auerbach’s original song from the animated feature “Run That Race”. Auerbach, who is also American rock band The Black Keys’ frontman, croons a tune that is true to Disney’s spirit of never giving up and always trying your best. A sample of the lyrics says it all: “I feel discouraged and I got myself/ But you know you can't blame it on nobody else/ Only you know where it is/ You belong, sing along’ We gotta run that race”. The other original song is American singer ZZ Ward’s aptly titled “Ride”. There is a nice retro feel to this tune which plays over the movie’s end credits. It is a track that you will find yourself re visiting and putting it on loop. The infectious melody also makes this song the most radio friendly track on the album. The inclusion of two instrumental tracks by country singer songwriter Brad Paisley is a thoughtful decision from the producers. You will love the electronic guitar arrangements, especially in “Thunder Hollow Breakdown” where guitar riffs capture the excitement of the demolition derby sequence. Elsewhere, there are covers by James Bay(“Kings Highway”), Andra Day (“Glory Days”), Jorge Blanco (“Drive My Car”) and Lea DeLaria (“Freeway of Love”). Another detail we love - DeLaria, who Is best known for playing Big Boo in the TV series Orangeis the New Black, voices the intimidating demolition derby Miss Fritter in the movie. It’s probably a marketing decision, but we would have adored the soundtrack even more if it contained Randy Newman’s score cues, which are compiled on a separate album. Quite a pity, because the CDs for Cars and Cars 2 managed to do it.